CBSE Syllabus For Class 7 Social Science: The CBSE syllabus for Class 7 Social Science includes three subjects – History, Geography, and Civics. Having a clear knowledge of these subjects can be extremely beneficial to the students. It will help them secure a high score in their Class 7 annual exam. Also, understanding the various concepts of higher classes will become easier if you have a strong command over the CBSE syllabus for Class 7 Social Science. It will also help you if you appear for various exams for government jobs, including the Civil Services Examination conducted by the UPSC. The CBSE syllabus for Class 7 Social Science should, therefore, be thoroughly finished. CBSE Class 7 follows the NCERT curriculum. In this article, we will provide you with the detailed CBSE Class 7 Social Science syllabus. You can also download the official syllabus in PDF. Read on to find out. 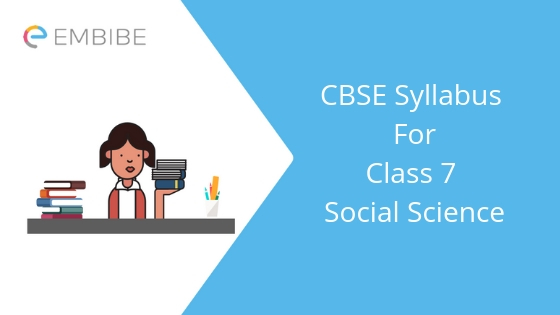 Let us go through the chapters in the CBSE Syllabus for Class 7 Social Science 2019 for each of these parts. Chapter 7 Human Environment Settlement, Transport and Communication. Now you have a clear knowledge of CBSE Syllabus for Class 7 Social Science, for all three sections – Civics, History, and Geography. Go through it and start your preparation. Finish all the chapters one by one and cover the whole syllabus. Make sure that along with your regular study you devote some time revising the topics you have already studied. Because all the three sections of Class 7 Social Studies need a lot of information to remember. So, regular revision is a must. Take practice tests and increase your speed and accuracy. Manage your time well and complete the syllabus on time. We hope this article on CBSE Syllabus for Class 7 Social Science helps you. If you have any question, feel free to post it in the comment box below. We will get back to you at the earliest.